The 2018 FIFA World Cup treated football lovers to 169 goals in 64 matches – and fans around the world have chosen Benjamin Pavard’s as the best of the tournament. In an online poll where over three million FIFA.com users casted their votes, Pavard’s outside-of-the-foot rocket for France against Argentina was selected as the best goal of tournament. 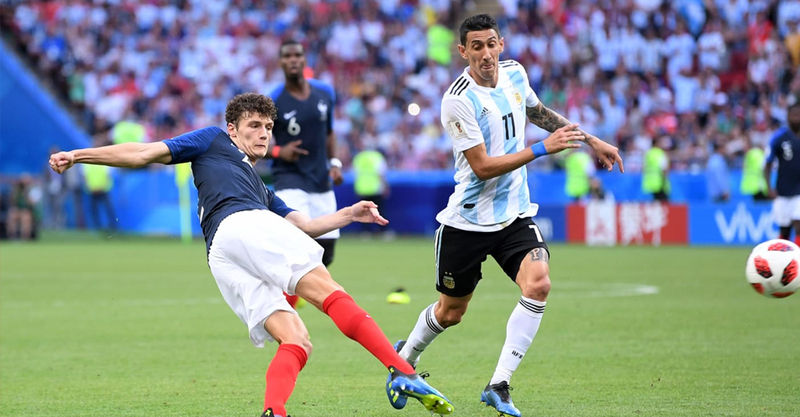 Pavard’s goal saw off stiff competition to win the accolade.Pavard becomes the first European player to win the Goal of the Tournament accolade since its creation in 2006. At Brazil 2014, it was bestowed on eventual adidas Golden Boot winner James Rodriguez, whose venomous, dipping volley also later earned him the 2014 FIFA Puskas Award. Other previous winners include Maxi Rodriguez (ARG) and Diego Forlan (URU) winning in 2006 and 2010 respectively. The defender, who showed superb technique to fire into the top corner, received the most votes cast by three million fans on the Fifa website. “I didn’t even think about it. I just tried to get over it and keep it down,” Pavard, 22, said after the game. France beat Croatia 4-2 in the final to win the trophy for the second time.Pavard added: “The ball bounced up as it came to me. I was trying to hit it in the direction it came from, which is what the strikers always tell me. Juan Quintero’s delightful low free-kick for Colombia against Japan in the group stage which finished second, and Luka Modric’s long-range stunner against Argentina, also in the group stage, which came third in the voting.